It’s technically the last weekend of Spring since Summer’s official 1st day is Monday, but in our home Summer has already arrived! My daughter is obsessed with chalk and drawling, and lately I’ve been obsessed with fixing up our backyard to be a more functional space. I ultimately want our backyard to become an extension of our everyday living space. 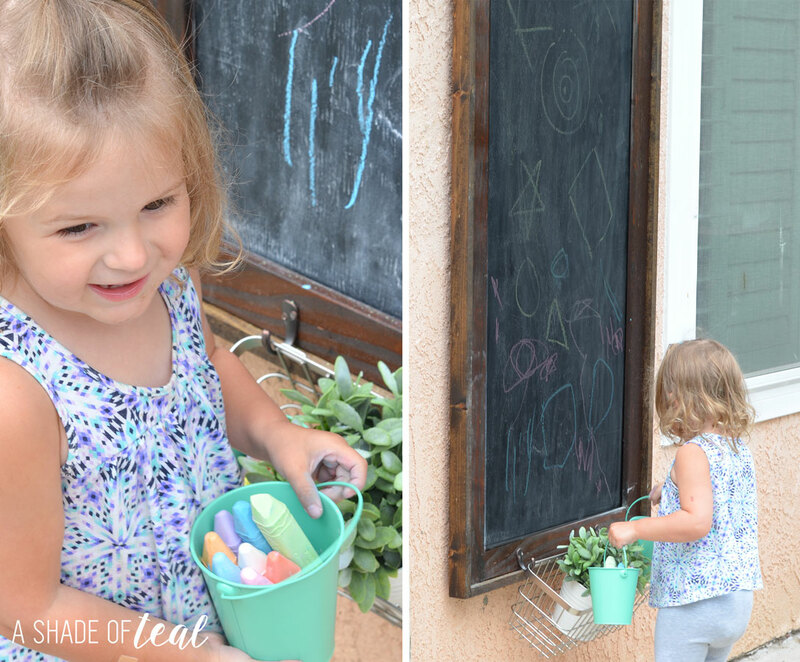 So why not make a removable chalkboard for her! Letting our daughter have outside playtime is really important. I love sitting in our backyard and letting her play but I’m also incredibly conscious of her sensitive skin. That’s why I use all® Free Clear detergent to help my family deal with sensitive skin & allergens during this time of year. 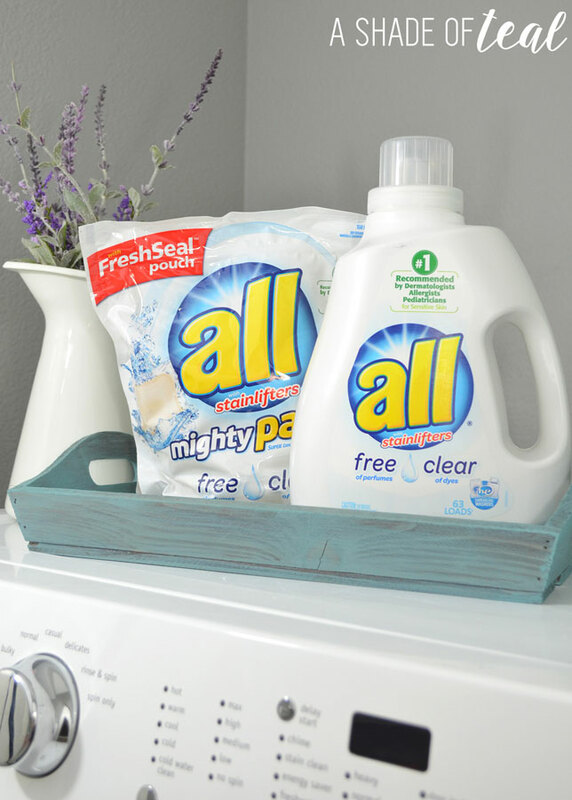 You can find all® free clear liquid detergent & all® free clear mighty pacs® at Target. While at Target I also purchased some supplies to create my Removable Chalkboard. Here’s what you’ll need. 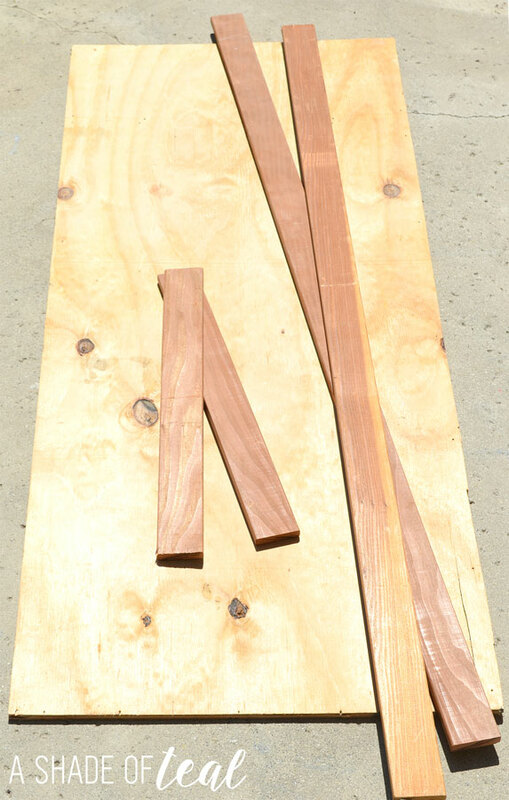 Plywood or under-layment board in the size you want. I used 1/2″ thick. Air Compressor, I use this one. 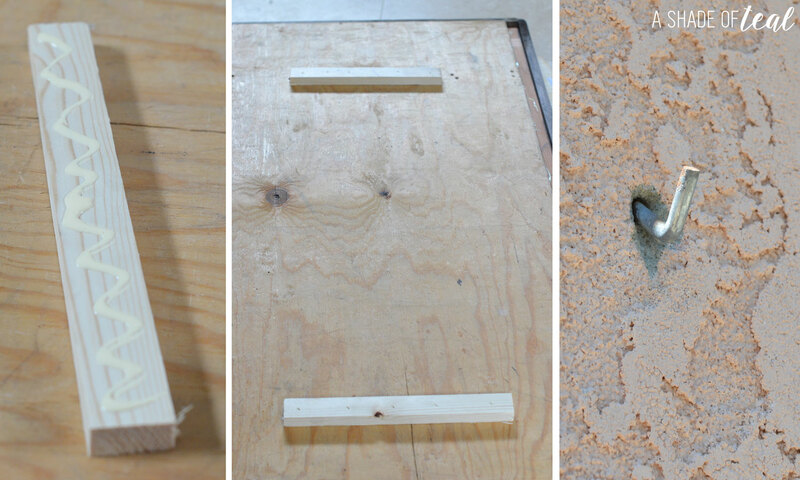 First step is to measure and cut the plywood to your desired size. I made mine 24″ wide by 55″ tall. I also cut my wood trim the same dimensions to serve as part of the frame. 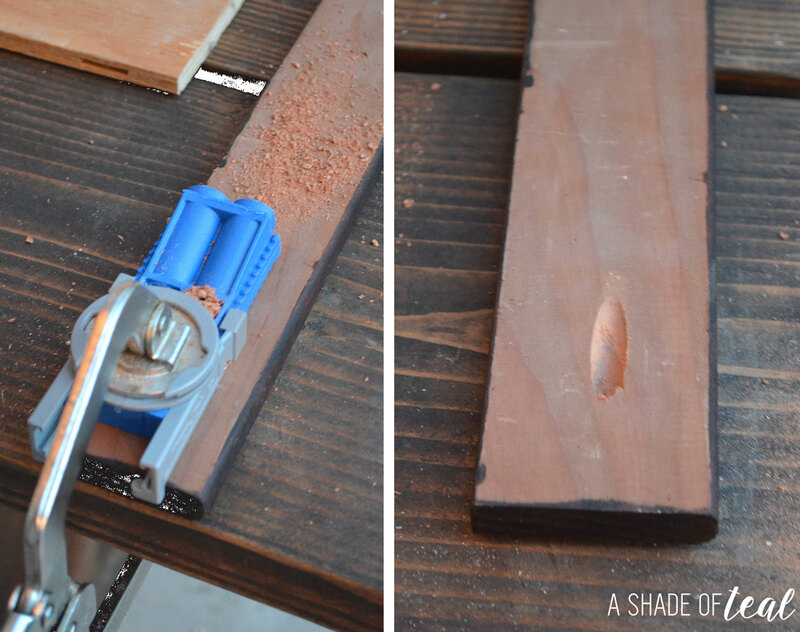 I then cut wood strips about 1 1/2″ longer to serve as the side of the frame. Next I stained all the pieces for the frame. While the stain dried I prepped the plywood by patching any holes with wood filler. 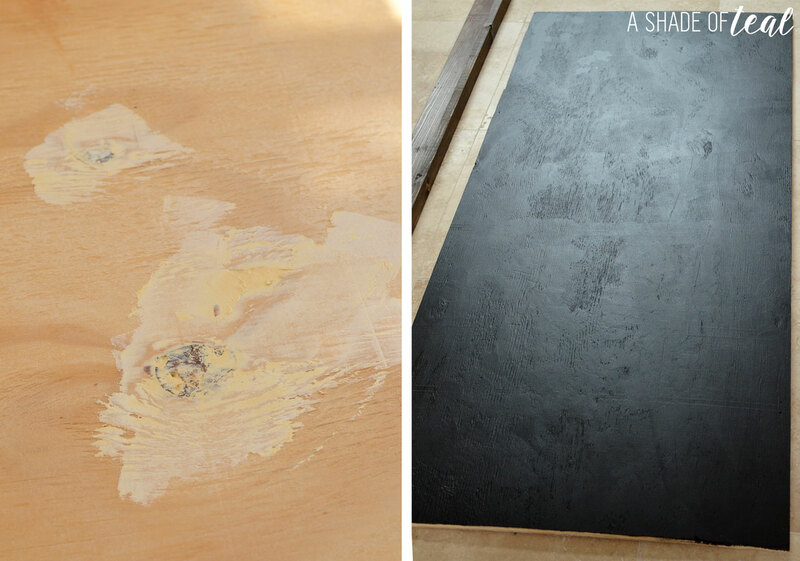 Once that dried I lightly sanded the entire board then added 2 coats of the black chalkboard paint. Now you can build the frame. I used my Kreg drill kit to make the flat part of the frame. 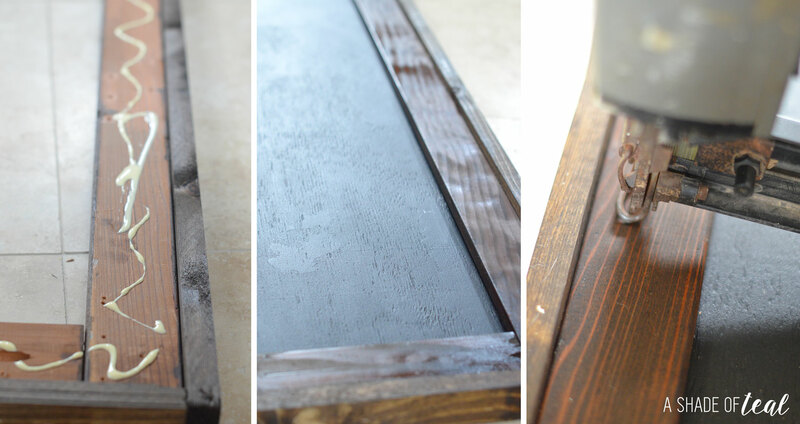 You can also nail the flat part of the frame directly onto the chalkboard. Below is how I assembled it. First I laid it out to make sure all the cuts would fit together. Then I assembled the flat pieces with screws (these were the pieces I drilled holes in with my kreg drill). I then used my nail gun to attach the wood strips to the top and bottom. Make sure to add glue as you go. Once the frame was completely built I sprayed it with a coat of poly to seal it. Since the chalkboard will stay outside most of the year it will need this extra protection. Next, add the painted chalkboard to the frame. I used glue and nails to hold it together. I then added some scrap wood to the back. This will be how it sits on the wall. For the outside wall I luckily already had this metal hook installed from the previous owners. So all I needed to do was hang the chalkboard up on it. Last I added the finishing touches. I added 2 metal hooks to the bottom of the frame. Then I placed the metal basket on the hooks. It’s the perfect place to store the chalk. That’s it! 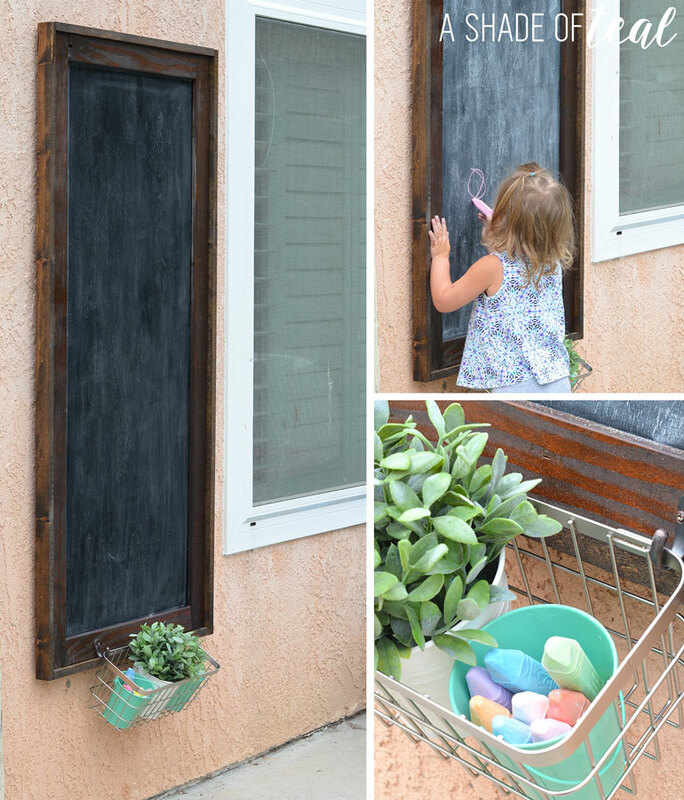 Just hang and condition the chalk board by rubbing a piece of chalk all over and its ready for use. My daughter absolutely loves it! I love the fact I can take it down in the winter when it starts to get rainy. For now she can enjoy it all summer long. 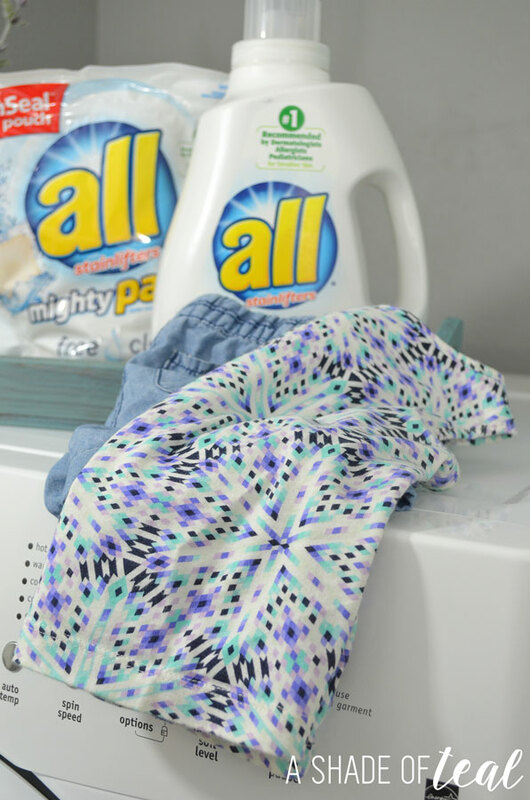 After a long day of use and getting covered in chalk, her clothes were due for a washing. Do you or your kids have sensitive skin? I highly suggest trying all® free clear products. You can also join the all® free clear community and connect with parents just like you! This looks like it would be great for kids. I would have loved this! I love this! It would be great for my boys as they wait for the bus. That is so great! I love it! My son would enjoy it for sure. 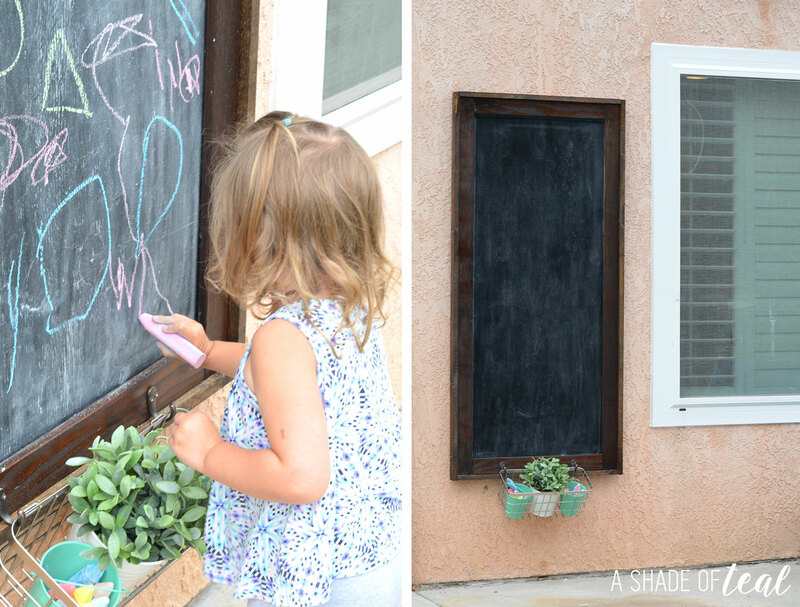 I love that the outdoor chalkboard is removable. And the little basket is perfect for holding plants. So cute! This is amazing! 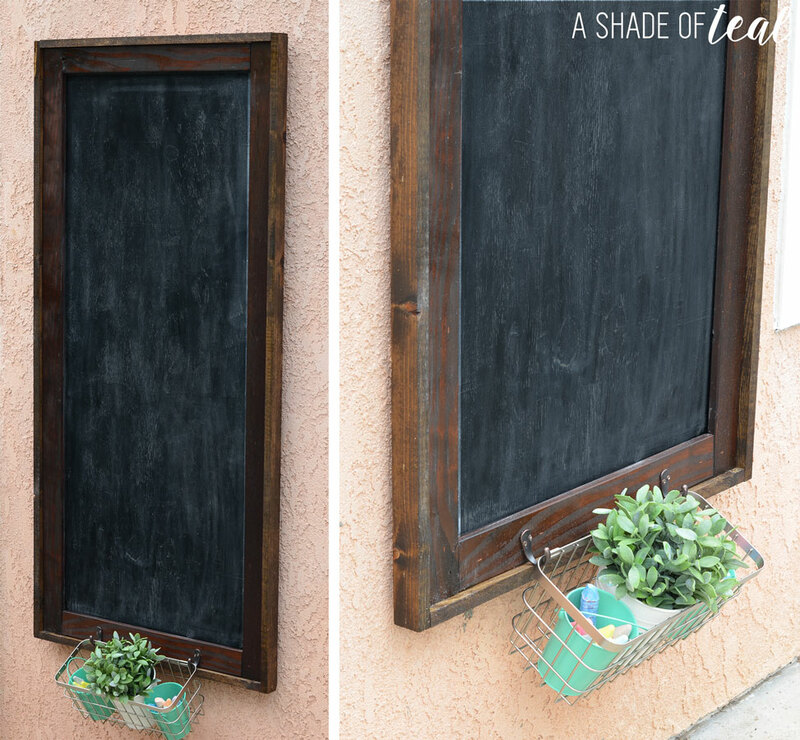 I really like the idea of making your own chalkboard. This will definitely keep the kids busy as well. It’s quite easy to do, I was initially intimidated by the idea. Pretty clever idea! That’s cute! What a good idea to make it outside. I love the addition of the basket. That’s a great idea. My girls would love to have one of these. I have always wanted to make some chalkboard items for them too. I would LOVE to do this. Especially since we rent our home. This way, we can take it with us when we move. I always love doing some quick DIY works & love to involve my kids as well so they learn something out of it. This is such a beautiful DIY work and your daughter seems to be enjoying it so much. Thanks for the wonderful tutorial with pictures! Wow! I am amazed for the D.I.Y chalkboard. Thank you for this one. I would like to try it myself.